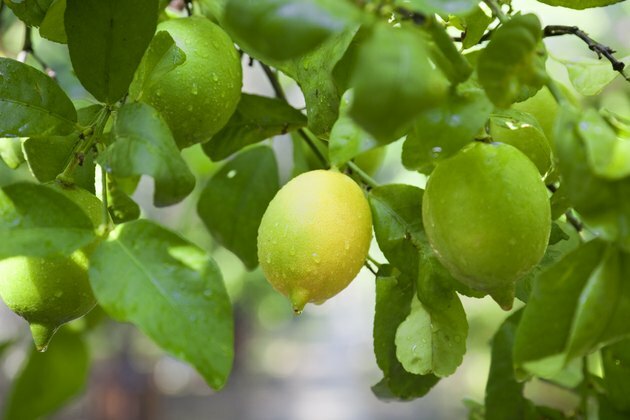 Few fruit trees are more decorative in your home garden than lemons (Citrus limon). The frothy, fragrant flowers make the trees look like ballerinas, and they are followed by the attractive fruits. Lemon trees thrive outdoors in U.S. Department of Agriculture zones 8 to 11 but can be grown as container plants almost anywhere, as long as you bring them inside during the cold season. They grow happily in any well-drained soil, but prefer a soil pH of about 5.5 to 6.5. Once your lemon tree is established, occasional water and feeding are your principal maintenance tasks. Harvest lemons when they are light green or yellow and allow them to cure. Lemon trees don't like wet feet, and as a general rule, they don't need much watering. Plus, watering a lemon tree's foliage and fruit can make it more susceptible to disease. Water any newly planted lemon trees every other day for the first week, and then one or two times a week for two months. In the first two years of life, water new lemon trees every five days or so during dry periods. Water mature lemon trees only about every seven to 14 days when the season is dry. Place a layer of organic mulch, such as tree bark, around the spread of the tree -- and at least 1 foot from the trunk of mature trees to help them retain moisture. For young, newly planted trees, sprinkle about 1/4 pound of a 6-6-6-2 fertilizer -- containing 6 percent nitrogen, 6 percent phosphate, 6 percent potash and 2 percent magnesium -- on the ground, under the spread of the tree's branches and slightly beyond. Do this every three to four months, gradually increasing to 1 pound of 6-6-6-2 fertilizer by the end of the first year. For mature trees, sprinkle 3 to 4 pounds of 6-6-6-2 fertilizer under the spread of the tree's branches every four to six months. Also spray the tree's leaves with a foliar spray containing chelated zinc or iron two to four times a year. A strong spray of water from time to time will help keep many of the bad bugs off a lemon tree because the dust that accumulates makes it harder for beneficial bugs to find harmful bugs. What's more, the spray will wash away harmful bugs such as aphids. Other common pests on citrus trees include the citrus leafminer moth, Florida red scale and snow scale, all which you can control by spraying the tree with a solution of 1/2 to 1 percent horticultural oil and 99 to 99.5 percent water. Fill an industrial sprayer with the solution, and spray the tree, coating each leaf. Only spray the tree in dry weather, in temperatures below 100 degrees Fahrenheit. To keep ants off the tree -- they can keep away beneficial insects -- set toxic baits such as a boric acid and sugar solution at the base of the tree, which the ants will eat and take back to their nests. Keeping bad bugs away will also help to prevent disease. This is especially important with younger trees that may be severely damaged by disease issues. Two of the most common lemon tree diseases are citrus canker and citrus scab. With citrus canker, you might see raised, brown spots on fruits and leaves, surrounded by a yellow halo. With citrus scab, you'll see warty formations on leaves and fruit. If a tree gets canker, it's best to remove it so it doesn't spread to other citrus trees. To prevent both diseases, spray the trees with a copper-based fungicide several times a year. Spray the tree with the fungicide after the lemon petals fall and again three weeks later. Also remove any old or dead wood to deter pests; lemon trees don't need much pruning beyond that. 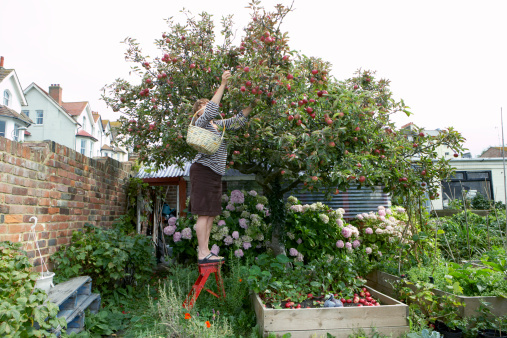 If you do prune, wipe tools down with a solution of 1 part bleach to 3 parts water to avoid spreading disease.